Reading is of vital importance and we foster an ethos of reading for enjoyment and pleasure. 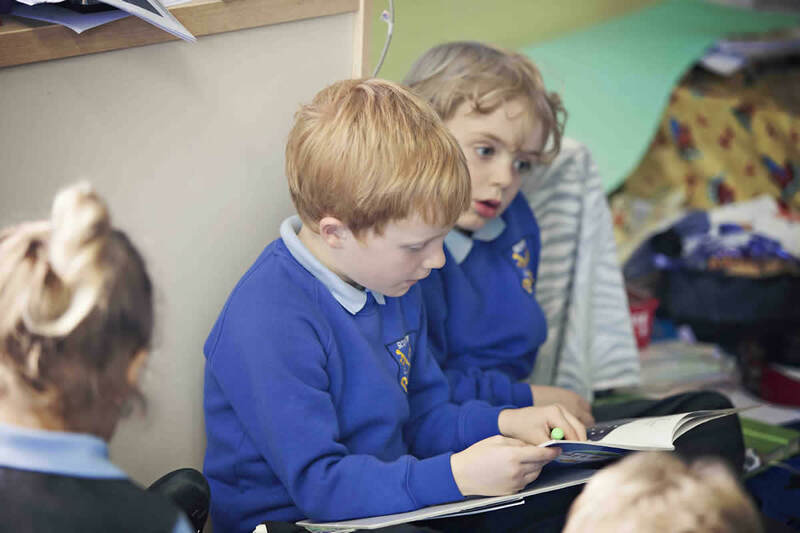 To help our children get a real breadth of reading, we use a combination of reading schemes, these include: Oxford Reading Tree, Floppy’s Phonics, Ginn and Project X. In addition to these schemes, we have an extremely well stocked library which has a wide and varied range of books from British classics to graphic novels – these are all ‘banded’ by how challenging they are so children are guided to read the books that are most appropriate for their personalised reading needs. To compliment the reading the children do we use two online reading programmes ‘Reading Eggs’ & ‘Renaissance Reading’ – these further develop the children’s understanding of the books they have read. All of this gives a variety of fiction and non–fiction books to develop children’s reading range and foster a life long love of reading. Our daily phonics sessions in school are fun, involving lots of speaking, listening and games. The emphasis is on children’s active participation. They learn to use their phonic knowledge for reading and writing activities and in their independent play. Children have time to practise and rapidly expand their ability to read and spell words. They are also taught to read and spell ‘tricky words’ – words with spellings that are unusual or that children have not yet been taught. These include the words ‘to’, ‘was’, ‘said’ and ‘the’ – you can’t really break the sounds down for such words so it’s better to just ‘recognise’ them. We also teach a wide range of nursery rhymes and songs and read good books to and with the children. This helps to increase the number of words they know – their vocabulary – and helps them talk confidently about books. Play: ‘What do we have in here?’ Put some toys or objects in a bag and pull one out at a time. Emphasise the first sound of the name of the toy or object by repeating it, for example, ‘c c c c – car’, ‘b b b b – box’, ‘ch ch ch ch – chip’. Say: ‘A tall tin of tomatoes!’ ‘Tiddles, the ticklish tortoise!’ ‘A lovely little lemon!’ This is called alliteration. Use names, for example, ‘Gary gets the giggles’, ‘Mark makes music’, ‘Nigel’s nose’. Children in Year 3 – Year 6 use Renaissance Learning online quizzes to assess their reading comprehension. Read Write Inc. is used across Reception and Key Stage 1 in the teaching of phonics. Oxford Reading Tree is the reading scheme used across the school along with other books to supplement it.